I recently decided to convert all of my future RAW files to DNG format. Finding information about DNG, however, left me confused when it came to options and efficiency issues inside of Adobe Lightroom. I hope to clear up that confusion for anyone else thinking about making this change. Please understand that what follows is my best understanding of DNG handling inside of Lightroom. I cannot guarantee accuracy, and I hope others will chime in if they see errors. This discussion assumes you are shooting in RAW format — as opposed to JPEG — with your digital camera. (JPEG shooters will find little reason to convert their files to DNG.) The discussion and menu descriptions below are relevant to Lightroom 5.7 on a Windows 8.1 computer. Why Make The Change To DNG? DNG is an open-standard file format, available to all camera makers and software companies. Unlike Nikon’s NEF, Canon’s CR2, and many other manufacturer-specific proprietary formats, DNG is more likely to provide long-term compatibility of raw files with future software platforms. It also alleviates the need for Lightroom’s separate sidecar (XMP) files, since develop settings and metadata additions can be stored directly in the DNG files. Additionally, DNG (typically) uses less space on your hard drive than the original raw formats. This is accomplished through the use of a lossless compression scheme that retains all of the image data from your original RAW files. Finally, “Fast Load” data can be included during the conversion process, enabling faster load times in Lightroom’s Develop module. 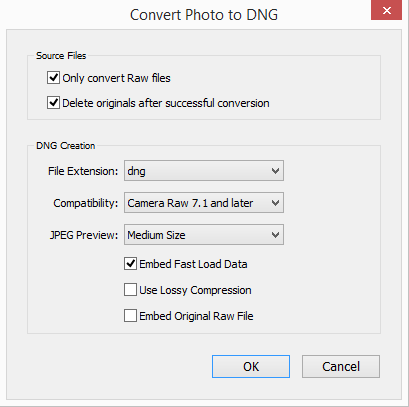 Converting to DNG may discard some proprietary information stored in original RAW files. Is this a big deal? Not for me. All of the image data and relevant settings are retained. Non-standard metadata — perhaps things like TTL flash-system data — might be discarded. The conversion process to DNG also takes time, and the extra delay may not be an acceptable burden to your standard workflow. Additionally, some manufacturer software packages will only work with their original proprietary formats and will not read DNG files. Only convert Raw files – Yes. RAW file formats will be converted, but JPEG, TIFF, or PSD files will be left alone. Delete originals after successful conversion – Yes. The new DNG files will contain all of the image data and relevant metadata. Keeping the original RAW files in addition to the DNG files wastes a good deal of disk space with little value added. File Extension – I prefer lower case “dng” as the file suffix. Compatibility – I leave this on the default (newest) setting. Other settings might be relevant if you are sharing files with people who have older versions of Adobe (or other) software. JPEG Preview – Medium Size. 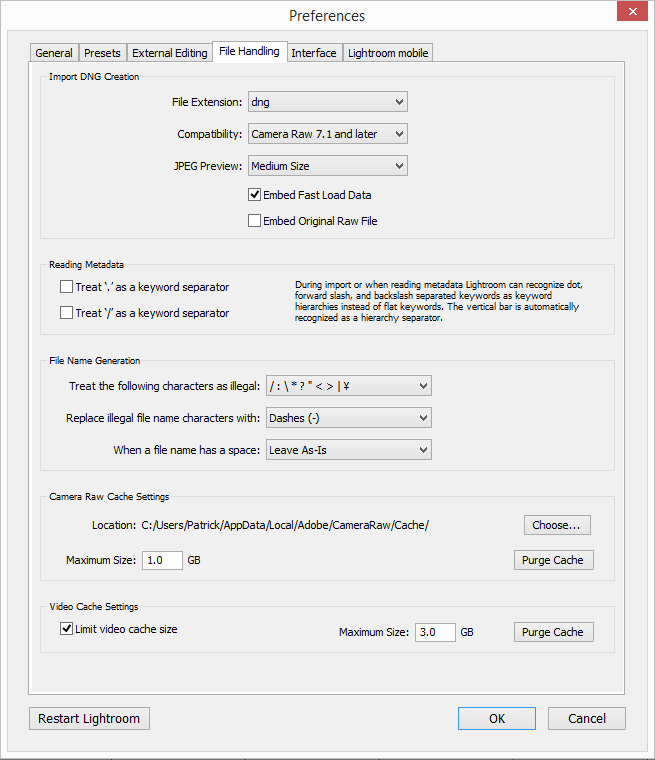 This setting is used to store a JPEG preview of the image inside of the DNG file. These previews are completely ignored by Adobe Lightroom and Photoshop, but may be used by operating systems and other software packages. For this reason, I like to have a JPEG preview present in the file, but full-size previews take up additional space and do not provide any benefit for my workflow. Full-size previews within the DNG files will not speed up Lightroom or Photoshop. Embed Fast Load Data – Yes. Including this data will help data load into Lightroom’s Develop module quicker. It does not affect the speed of Lightroom’s Libray module. Use Lossy Compression – No. DNG already employs a lossless compression scheme to reduce file size without throwing away any of the original image data. Turning lossy compression on will allow greater compression and even smaller file sizes, but will throw away some of the original data in the process. Embed Original Raw File – No. This flag will incorporate the original RAW file within the DNG file, in addition to the data that is already there. This effectively doubles the resultant file size with little anticipated benefit. The conversion to DNG can also be done during import, if desired, at the beginning of your workflow. I find the import process to be frustratingly slow to begin with, so adding on the DNG conversion up front is not appealing to me at all. Of course, you could always leave the room and do something else while the import process runs, returning at a later time. When performing the DNG conversion during import, the options discussed in the section above are available through the “Edit”–> “Preferences” menu entry. You then select “Copy as DNG” from the top-center section of the Import window. The rest of the import process remains unchanged. This was the single most confusing attribute to figure out when learning about DNG. In the Lightroom dialog boxes above, you can select one of the following for the JPEG Preview to be embedded in the DNG file: None, Medium Size, or Full Size. Adding the JPEG preview to a DNG file increases the file size (slightly), but does not directly affect the speed of processing within Lightroom or Photoshop. Neither of these Adobe programs use the DNG embedded preview in any manner whatsoever. Lightroom manages its own set of JPEG previews for library images, separately from the internal DNG previews we’ve been discussing here. They are managed through the “Library” ==> “Previews” menu, or from the “File Handling” box on the Import window. Lightroom previews are stored in the library’s “*.lrdata” directory and are typically discarded after 30 days (this can be changed in the “Catalog Settings” dialog). 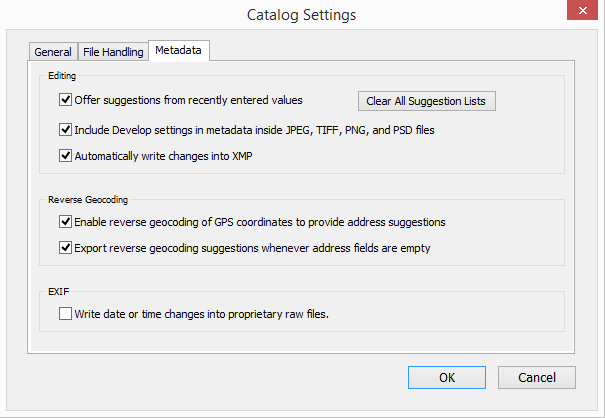 If you would like develop settings to be written directly into your DNG files, you need to set the “Automatically write changes into XMP” flag within the Catalog Settings dialog (“Edit” ==> “Catalog Settings”). This will cause all changes from the Develop module to be automatically added to your DNG file, without altering the original image data. This is generally considered a smart thing to turn on, regardless of whether you use DNG or XMP sidecar files (“A Lightroom Tip That Could Save You”). If you have made substantial edits to a photo and would like those changes reflected in the JPEG preview within the DNG file, this can be accomplised by selecting the photo(s) in the Library module and using “Metadata” ==> “Update DNG Previews & Metadata”. For my specific test image — which may or may not be representative of a typical image in your collection — the basic DNG file requires 11.9% less space than the original NEF file (42.9 MB vs. 48.7 MB). Adding the Fast Load Data will increase file size slightly to 43.9 MB. From here, if we add an embedded medium-sized JPEG preview to the file. the resultant DNG file comes in at 44.0 MB. (This is the storage configuration that I am using in my daily workflow.) If we now replace the embedded JPEG preview with a full-size version, the file is now larger than the original NEF file (51.2 MB vs 48.7 MB). For completeness, I also performed the conversion using Lossy compression (resulting in a substantially smaller file) and also by including the original RAW data (resulting in a substantially larger file).